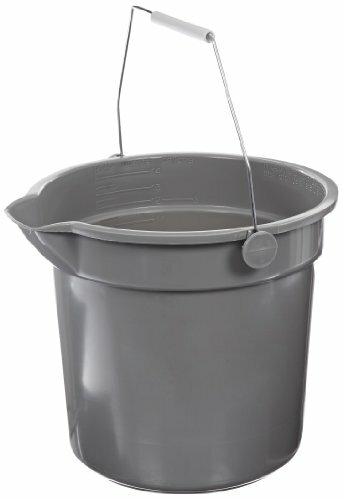 Deluxe heavy-duty bucket. 14 quart. Capacity. Rugged heavy-duty construction. Made of high density polypropylene. Molded pour spouts. Embossed graduations, quarts and liters. Resists acids, alkalies, chemicals and cleaning compounds. Made of USDA approved materials. Measures 10" length by 14-1/8" width by 12-1/2" height. Gray color.